Indoor climbing gym Onsight Climbing Gym is located within Singapore’s Geylang area, at 100 Guillemard Road. 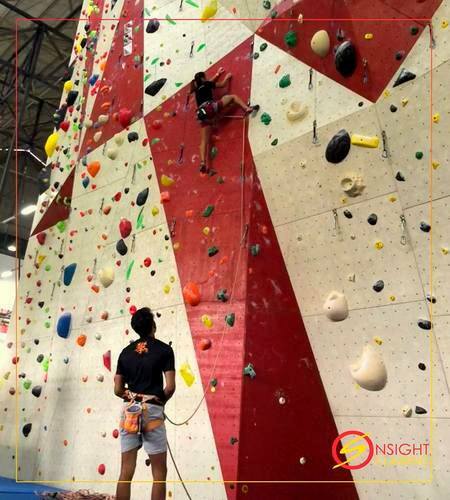 Open to customers since May 2011, Onsight Climbing Gym is the biggest indoor climbing gym in Singapore. The climbing gym features a space of 10,000 sq ft, with a 2000 sq ft of bouldering surface, 43 lanes with over 100+ routes, as well as a 15 m speed climbing wall. In addition to a climbing gym, Onsight also has sport climbing courses, coaching and training services, plus retailing of sport climbing equipment and apparel. The official Onsight Climbing Gym Facebook page is located at www.facebook.com/onsightclimbing/. You can also follow the official Onsight Climbing Gym Instagram account, which in turn is available at www.instagram.com/onsightclimbinggym/.